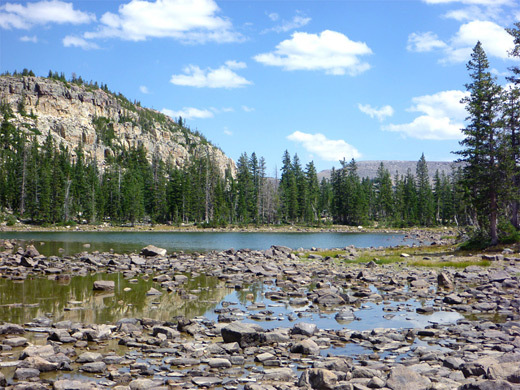 Most of the Uinta range is far from any road, including all the highest peaks (over 13,000 feet), but Naturalist Basin, the region considered by some to be the most beautiful, is within range of a (long) day hike, starting from UT 150, the one main road through the mountains. 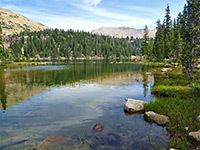 After a sometimes tedious five mile approach through thick forest, the woods give way to stark, rocky cliffs and plateaus above the treeline, containing several pretty lakes and ringed on three sides by steep, scree-covered hillsides sloping up to the mountain crest, with two major summits (Mount Agassiz and Spread Eagle Peak) close by. The maintained trail ends at the shore of one of the furthest lakes (Shaler) but it is relatively easy to climb to the ridgetop separating the two summits, for fantastic views south over the basin, and north over the adjacent valley, formed by Stillwater Fork of the Bear River, which also contains a few scenic lakes at its upper end. The round-trip hike to the ridgetop is 14.5 miles, gaining 1,800 feet, but most of the climbing is done gradually so although long, the trip is not too arduous. Most people visit the basin on backpacking trips however, allowing more time to explore the lakes, and perhaps to climb to the top of one or both of the two nearby peaks; again there is no recognized trail to the summits, but the terrain is fairly straightforward. Topographic map of the Highline Trail to Naturalist Basin. 32 views of Naturalist Basin; gallery, slideshow. 18 views of wildflowers. Blue Lake, Mount Agassiz, Shaler Lake. 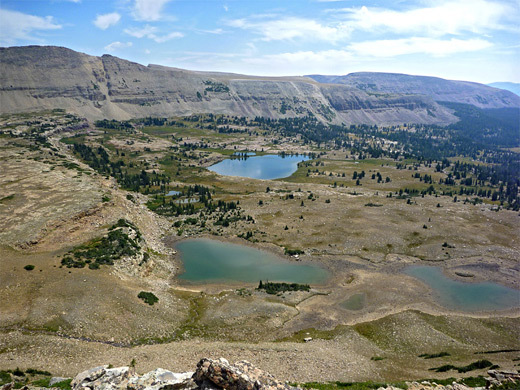 The hike to Naturalist Basin begins at the Highline Trailhead, located in the woods on the east side of Highway 150, near 10,347 foot Hayden Pass. The Highline Trail is a 96 mile route crossing most of the Uinta range, to an easterly start point along US 191 between Vernal and Flaming Gorge NRA. The western trailhead is not too busy as there are no short hike destinations hereabouts; most visitors are backpackers, or horseriders. Nonetheless, the basin is not a destination for those seeking perfect solitude; busy periods in midsummer may see several dozen people camping in the vicinity. The Highline Trail descends through open forest, rocky underfoot, and passes a junction after half a mile with a connecting path to Mirror Lake. The main route is signed Rocky Sea Pass, which is 7.5 miles away. The next landmarks are a sign marking the boundary of the High Uintas Wilderness, a small stream flowing from a meadow on the left, and a larger stream and meadow a little further. The ground starts to rise gently, but the surroundings remain the same - unremarkable pine forest, generally dry, so wildflowers are relatively few in number. The second junction is with a short spur to tree-lined Scudder Lake on the right, after which the path is a fairly level for a while, passing another meadow (on the left), where Mount Agassiz comes fully in to view for the first time, albeit briefly, rising above the trees on the far side. This is followed by a third junction, with a southwards path to Wilder, Wyman and Packard lakes, and then some boardwalk sections over more marshy ground. 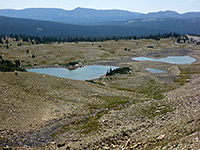 There is little change for another mile to a fourth junction, where the Highline Trail continues straight on, and the route to Naturalist Basin forks off to the left (north). This has some gentle ascents between level parts, through woodland that begins to thin, as the trees mingle with piles of whitish boulders, yet views of the mountains ahead remain quite limited. The scenery becomes more interesting after about 5 miles, as the forest opens to a moist meadow centered on a small stream, bordered by sheer, cracked cliffs to the north. The trail crosses the stream (just after an inconspicuous junction with a spur to Morat and Blue lakes, which forms the return part of the loop hike), then parallels the edge of the long, narrow meadow and on to the first significant climb, up a short but steep cliff face to the flatter land above, past a pond and out to the banks of Jordan Lake, decorated by clusters of blue gentiana calycosa and red rhodiola rhodantha. 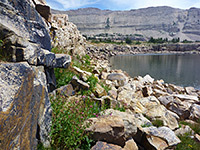 The rocky shoreline is followed east then north, whereupon the path crosses grassy flats and ascends another 250 feet, moving right above the treeline to a short grass plateau dotted with numerous white boulders, at the edge of the main part of Naturalist Basin. The underlying rocks are flat and layered, forming level terraces and short vertical cliffs, all split in an attractive, blocklike pattern. The next lake (Shaler) is a short distance east, and the path fades away when approaching the shore. Many wildflowers grow along the base of low cliffs on the north side, fed by tiny springs; blooms occur in colors of yellow, blue, red, pink, purple and white. Shaler Lake marks the end of the official trail; ahead are steep, sparsely vegetated hillsides running west and south from 12,540 foot Spread Eagle Peak, but the slopes are quite easy to climb and one obvious target is the lowest point of the nearest ridge (11,328 feet), half a mile northwest of the lake. 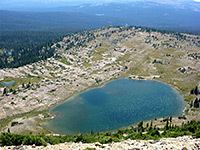 The route leads past two little ponds to the highest lake in Naturalist Basin (Faxon), which is also lined to the north by jointed, blocky, white cliffs, with scree slopes above, formed of boulders at the lower elevations, looser, earthen slopes in the middle and solid rock higher up, sheltering clumps of stunted trees. The top of the rocks reveals a fantastic view northwards over Middle Basin, the big valley of Stillwater Fork, surrounded by other jagged peaks and ridges, with meadows and lakes far below, rather lower than Naturalist Basin on the south side. The hike continues west along the ridgeline, rising another 320 feet up increasingly rocky terrain of crevasses and angular boulders, to a minor summit formed of mottled brown/white rocks speckled with green and black lichen. On the far side, a shorter descent reaches the next saddle, a flat area of reddish rock, and a patch of tiny trees just a few inches high. This is a suitable point to descend back to Naturalist Basin - down rather steeper slopes than before, crossing a few bands of small trees, to the sparkling waters of Leconte Lake, then west up a gentle slope past patches of somewhat bigger trees to the larger Blue Lake, set right beneath Mount Agassiz - a peaceful, sheltered place, where only the movement comes from fish nudging the surface. A trail reappears on the south side of the lake, passing a pond then dropping down a steep hillside to the two Morat Lakes, one of which is quite shallow and partly dries up in summer. The main route loops around the far side of the eastern lake but a shortcut continues straight, between the two. 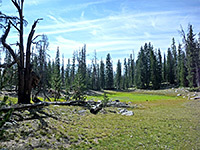 Next is another sharp descent, to a meadow containing a tiny pond, where the course of the trail is temporarily not obvious, but it follows the eastern edge of the meadow, across the green, lichen covered boulders lining the exit streamway, then descends gradually to a junction with the main Naturalist Basin trail. This point is 5 miles from the western Highline Trailhead.